Why do we gesture when we speak? 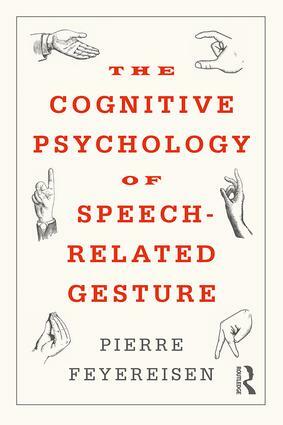 The Cognitive Psychology of Speech-Related Gesture offers answers to this question while introducing readers to the huge interdisciplinary field of gesture. Drawing on ideas from cognitive psychology, this book highlights key debates in gesture research alongside advocating new approaches to conventional thinking. Beginning with the definition of the notion of communication, this book explores experimental approaches to gesture production and comprehension, the possible gestural origin of language and its implication for brain organization, and the development of gestural communication from infancy to childhood. Through these discussions the author presents the idea that speech-related gestures are not just peripheral phenomena, but rather a key function of the cognitive architecture, and should consequently be studied alongside traditional concepts in cognitive psychology. The Cognitive Psychology of Speech Related Gesture offers a broad overview which will be essential reading for all students of gesture research and language, as well as speech therapists, teachers and communication practitioners. It will also be of interest to anybody who is curious about why we move our bodies when we talk.